Taking the sometimes-varied temperatures of maturing buildings, bridges, and roads to determine general deterioration and ward off natural disaster damage is a monumental challenge that Maria Q. Feng meets head on. Feng has been revolutionizing real-time sensory technology and structural health monitoring over the last 20 years in an effort to go beyond traditional visual inspection-based maintenance. Feng adheres to a multilayered approach to stave off any potential civil infrastructure issues. First, she says, a sensor embedded in a structure can detect fatigue and stress in real time. Next, the captured data will help guide engineers toward seeking a cost-effective treatment to prevent a major calamity, while a warning can be issued to prepare people for a potential catastrophe. Feng’s recipe for long-term, real-time monitoring is currently used on three bridges and one office building, all located in Orange County, CA, where sensor data is constantly collected. Feng, who also directs Columbia Engineering’s SMaRT (Sensing, Monitoring and Robotics Technology) Laboratory, grew up in a big family surrounded by engineers and scientists. She became fascinated with engineering after listening to her beloved oldest uncle describe in great detail how he and other engineers used primitive tools to build the first railroad, now more than 60 years ago, in the steep mountains of southwest China. Even with today’s modern technology, Feng admits there are challenges associated with the wide implementation of sensor technology for civil infrastructure monitoring. She notes that the sensor should be less expensive and easier to implement; advanced data analytics also are required to extract meaningful and reliable information from the sensor data; and end users need a way to adopt the research results into practice. To that end, Feng is also busy developing vision sensors using low-cost video or digital cameras to measure infrastructure deformities, along with creating the analytics needed to assess any deformations. Likewise, she’s exploring the feasibility of using smartphone sensors to track structural integrity. Feng’s research isn’t limited to civil infrastructure; she’s also concerned about protecting military personnel from unexpected brain impacts. Her integrated sensing and data fusion technology is being used to develop a personal airbag protection system to prevent traumatic brain injuries caused by blasts, accidents, and other sources of possible head damage. If a blast event occurs, the wearable airbag is triggered by unique electromagnetic sensors before shock waves strike. 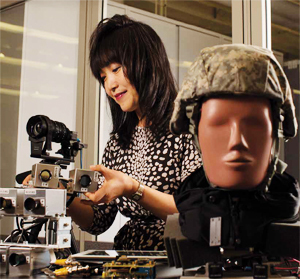 Sponsored by the U.S. Department of Defense’s Rapid Innovation Fund, Feng and her team have developed the prototype sensor system to combine intelligent data fusion and a triggering algorithm. They have successfully tested the sensor system with the U.S. Army. 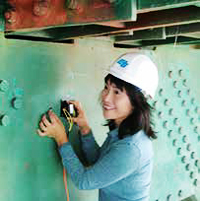 Feng’s impressive engineering career isn’t without a touch of irony; she confesses to having a fear of heights but still enjoys going to bridge and building sites to conduct her own field experiments. For the future health of city infrastructures everywhere, let’s hope “the last time” for Feng stays further down the (well-monitored) road. In late 1936, at the dedication of the Henry Hudson Bridge connecting Manhattan and the Bronx, master bridge builder David B. Steinman (Class of 1911, PhD) had realized a dream that went back to his years at Columbia Engineering. When he was earning his doctorate in civil engineering, his thesis had proposed an elegant steel arch design at that very location. Twenty-five years later, the bridge was built with few changes from his original design, becoming at that time the longest plate girder arch and fixed arch bridge in the world. Raised and educated in New York City, once working as a newsboy, Steinman (1886–1960) taught at the University of Idaho for a few years after graduating from the Engineering School, before returning east to work on the Hell Gate Bridge between Manhattan and Queens. Developing a reputation for resilient and economical structures, he steadily rose to the top of the profession, building more than 400 bridges on five continents, including the Mackinac Bridge connecting the upper and lower peninsulas of Michigan and, his personal favorite, the St. John’s Bridge in Portland, OR. Steinman was also commissioned to remodel the Brooklyn Bridge to accommodate the bustling traffic of the postwar boom. An expert in airflow and wind velocity with a cautious approach to building aerodynamically stable bridges, Steinman founded the National Society of Professional Engineers in 1934 to uphold excellence in the profession. Particularly after correctly predicting the spectacular collapse of the original Tacoma Narrows Bridge in Washington, he championed the highest standards in engineering construction and education, and upheld them in his own work. Steinman was also an author of some distinction, becoming a historian and ambassador of his profession in acclaimed works of biography and verse. “A bridge is a poem stretched across a river,” he wrote. More than 50 years after his death, Steinman’s artful designs and passion for safety continue to inspire the engineers who follow in his footsteps.